This is not my laundry. I have much more. We’ve been having some off days over here. The sink’s been broken since Motzei Shabbos, and it has remained broken despite my, and my landlord’s, best efforts at fixing it. A professional is coming tomorrow morning. The kitchen is a disaster. 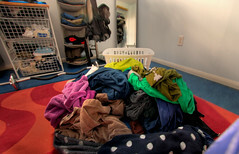 I still haven’t caught up on laundry since returning from our trip to Memphis, and the bins are overflowing. I was actually going to get cleaning help last Thursday (usually it’s just up to me), but she was a no show. And, to top it all off, my allergies have arrived in full force, leading to constant sneezing fits, a mild headache and general lethargy. I need to purchase allergy medication, and soon! This is in addition to a relatively demanding toddler and baby pair, who, thank G-d, really do require most of my attention most of the time. I’m blogging now because I find it all utterly overwhelming. Did I mention that I need to pack for our upcoming move? So, I wasn’t feeling greatly inspired to write a Torah Tuesdays post. I was mildly hoping that some brilliant insight or pasuk from Pirkei Avos would just pop into my head, and I could write a witty and applicable post that would be both entertaining and helpful. But, not so much. Just a sniffly nose and desire to avoid doing actual housework. Then something did occur to me (Baruch Hashem). I remember learning in seminary that we should try to daven even when we don’t feel like it. The idea was that, even on the days when we weren’t feeling overly spiritual, when we were feeling more spacey, or more connected to the physical world, we shouldn’t use the lack of inspiration to keep us from performing the mitzvos. We were encouraged to continue the act of davening, to try and muster all the concentration and sincerity we could, because someday, when we would be feeling particularly inspired, the framework with which to daven to Hashem would be solidly intact, not a distant memory. Kind of like practicing the piano even when there’s no concert coming up. Okay, so that idea, of keeping up the routine even when you don’t feel like it, can totally apply to more than just davening. It can apply to being pleasant to a loved one when a bad mood has descended upon you. It can apply to wearing modest clothing when the latest styles are oh-so tempting. It can certainly apply to mothering (especially at, say, three in the morning). I am going to apply it to doing housework right now. Even though I really don’t feel like it at all, keeping up a good routine is going to help me when my house is running smoothly again. What are some examples in your life of things that you do even when you don’t feel like it? So did you feel better after you did the housework? I often find that once I actually make myself do the dreaded task, I feel so much better. For me, it’s paying bills and going through all our mail. And keeping the kitchen organized. Some days, working out. You know, I *did* feel better. I always do, too. Keeping up with the housework is my big challenge. I’m just not great at it (okay, I was much better before I was also running behind two little cutiepies, that’s certain!). Nice for reminding us of this simple, but useful, principle. Good question…too tired to find an answer but I’m sure I have many things I’d rather not do but just end up getting them done cuz no one else is gonna do it for me. Just wanted to let you know I read this post and really like it!